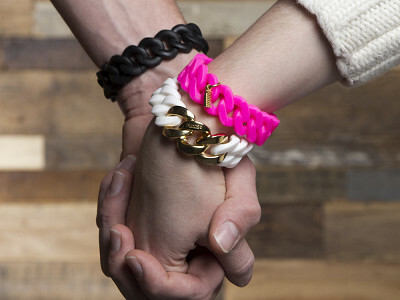 They’re trending, they’re hot, and everyone in our office wants one…or two, to stack on their wrists. Rubbs are bracelets with an interlocking link pattern, made with vibrantly colored, high grade silicone and adorned with a signature Rubbs’ charm. They instantly add punch to any outfit. Rubbs was founded in Miami by young entrepreneurs and twins Daniel and Elle Mawardi. They designed the unisex bracelets for style and comfort. The wide variety of colors, from hot pink to sleek black blinged with gold links, seamlessly transition from season to season and year to year. Moderately priced, they make unique, affordable gifts. Wear alone, mix and match, stack them up or dress them down. These charming bracelets are for everyone, everywhere. They’re trending, they’re hot, and everyone in our office wants one…or two, to stack on their wrists. Rubbs are bracelets with an interlocking link pattern, made with vibrantly colored, high grade silicone and adorned with a signature Rubbs’ charm. They instantly add punch to any outfit. Rubbs was founded in Miami by young entrepreneurs and twins Daniel and Elle Mawardi. They designed the unisex bracelets for style and comfort. The wide variety of colors, from hot pink to sleek black blinged with gold links, seamlessly transition from season to season and year to year. Moderately priced, they make unique, affordable gifts.